Last year, I became better a lot better at managing my money. Not perfect, but better. One of the ways I realised this was thanks to the buyer’s archive. The brainchild of Elise from Elise and Life, the archive was set up as a way to be more mindful about non-necessity spending. When I discovered Elise’s project, I was working in social media and earning £6.50 an hour; every penny counted. However, my return to teaching saw my dedication to the buyer’s archive fizzle. It’s not that I stopped being frugal, I stopped recording my spending and that, my friend, is a very dangerous thing indeed. In January, I fell off the thrifty bandwagon. I hold my hands up and confess: I shopped online in the January sales. Because of my return to work, I had less time to search charity shops and the Lindy Bop, Louche and Yumi sales were all saucy temptresses. Needless to say, I returned most purchases. So, what stayed? I’ve been wanting more novelty handbags since I’ve been wearing my camera bag non-stop. You might have seen that I bought the robot bag back in December? When Accessorize decided to reduce their rocket bag to £10.50, I thought I’d have that too! 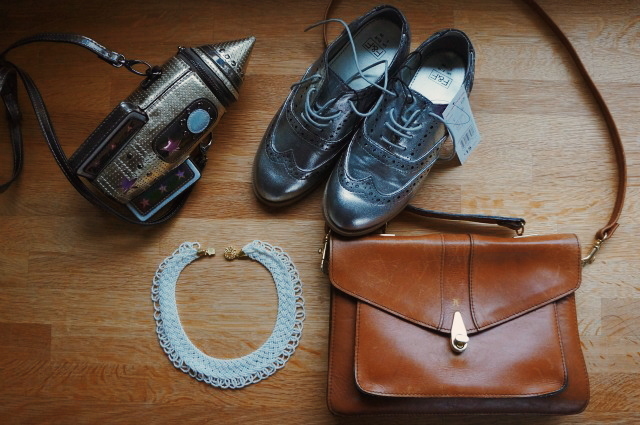 It’s still in stock, you can find it here: Accessorize Rocket Bag. Silver brogues. So bright and glitzy, I’ve never been sure that I can pull them off. In fact, I’m still not sure but for £2.99 I’m willing to try. Good quality shoes in charity shops are sometimes difficult to find, these brogues are brand new with tags and I’m already planning what to wear them with. 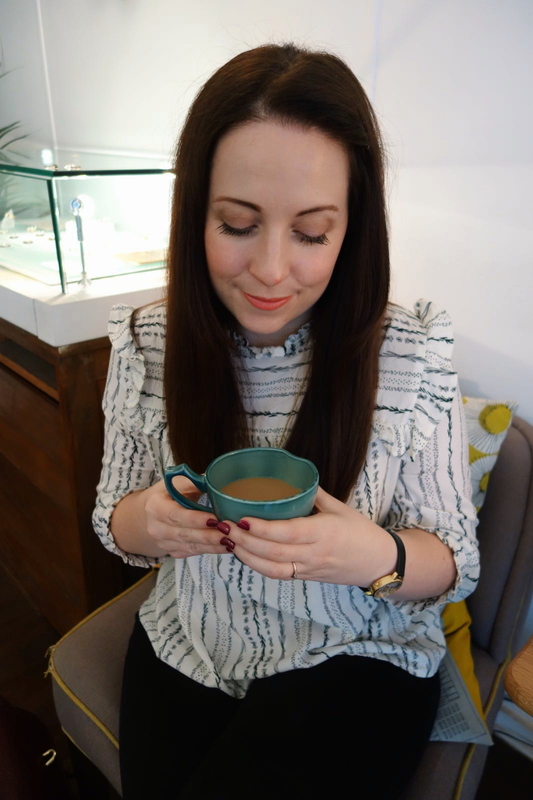 On Saturday, I met Katie for a coffee and cake date close to her house in Earlestown. 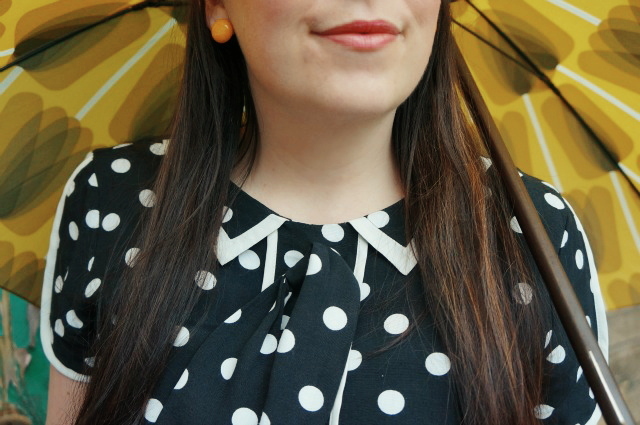 We popped into the British Red Cross and I was rewarded with a polka dot dress, complete with collar and bow tie. The condition isn’t amazing, it’s slightly bobbled but it’s my dream dress and I can’t wait to share it in an outfit post this week! John and I made our first trip together to Bygone Times, Chorley. It was a brilliant day full of nostalgia: I enjoyed it so much I wrote about it here. We’d almost finished our trip, when I spied this beaded necklace nestled at the bottom of a basket full of tat. As you know, I love, love, love collars and even though I haven’t worn it yet, I know I will. When I went to Poland, it forecast rain for the duration of our stay. I desperately tried to find a reasonably priced raincoat to no avail. 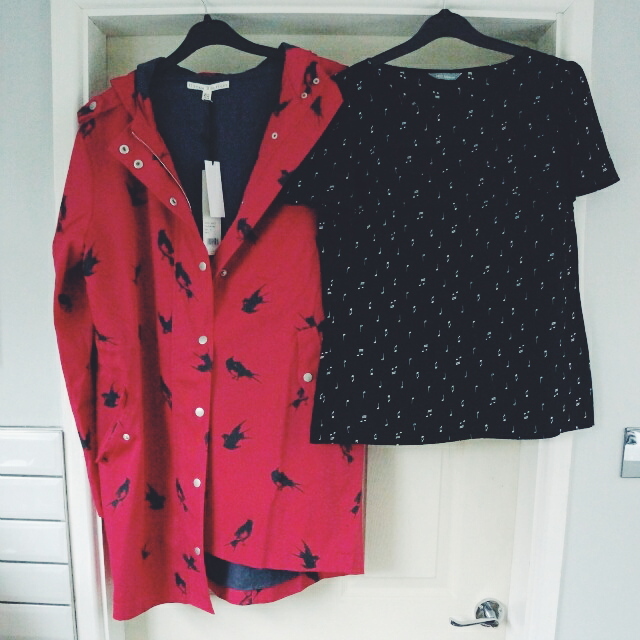 When I found this bird print longer-length jacket at £15, I didn’t hesitate to order it. I’m so glad I did! You know me, I love anything with a novelty print and let’s face it, I’m a sucker for a musical print (the new Lindy Bop ‘Christie’ dress isn’t half tempting me, have you seen it?) This top will be perfect for work and I needn’t worry about getting pen all over it! Which brings my total spend for January to… £41.46. Not too bad considering I bought two new handbags, a pair of shoes, a necklace, a raincoat, a top for work and, breathe, a dress! What do you think?